Here’s my easy recipe for fried ripe plantains or platanos maduros fritos, a must-have side dish for so many Latin dishes. 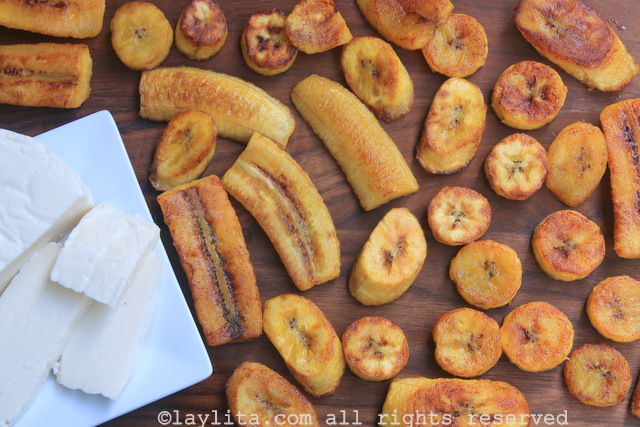 I experienced overexposure to plantains when I was growing up (and it was great). We grew plantains on the farm, my mom used to make us fried ripe plantains for breakfast. 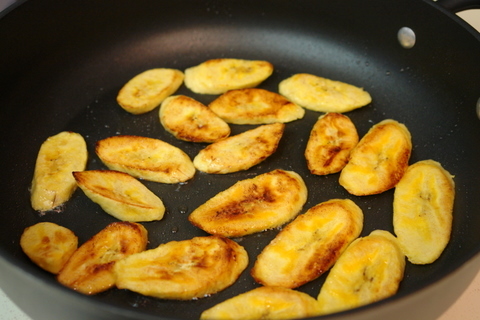 Fried plantains are one of the first things I remember cooking on my own as a kid. The snack stalls in the city and at the beach sold the best whole ripe plantains fried and stuffed with cheese. I could fill a cookbook with all the plantain recipes I know. There are so many different ways to prepare them and the taste of each dish is completely different even though the same main ingredient is used. I love dishes made with green or unripe plantains as much as I do those that are made with ripe ones. 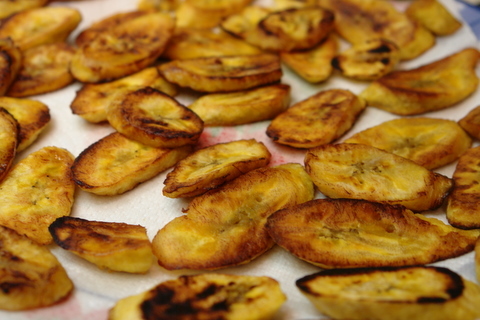 Fried ripe plantains are probably the most well known way to cook plantains and also the easiest way to cook them. 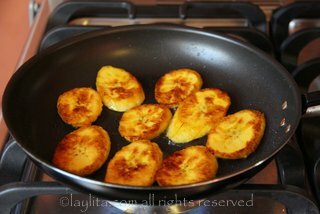 Easy recipe for fried ripe plantains or platanos maduros fritos, a must-have side dish for so many Latin dishes. If adding cheese, sprinkle the cheese over the plantains and serve. 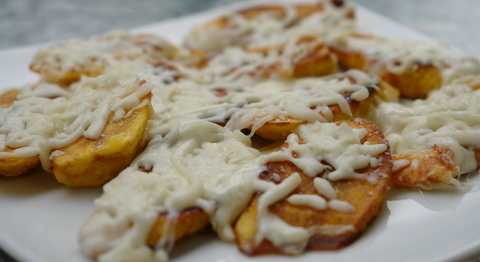 If you using a grated cheese then it is best to skip step #5, once the plantains are done leave them in the frying pan and add the grated cheese on top, remove from the heat to avoid burning them and let the cheese melt. 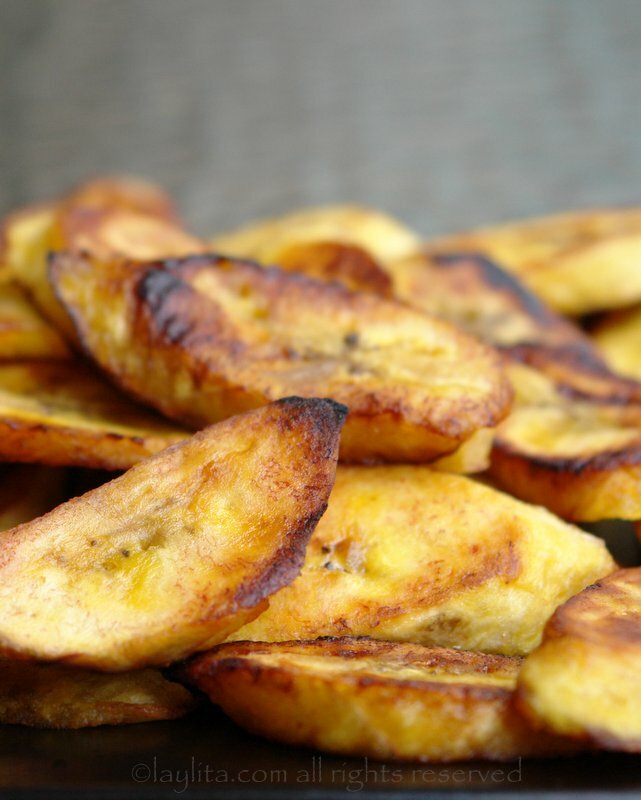 Fried ripe plantains go well as a side dish for almost any meal, especially if the meal involves rice, one of the most simple and delicious meals you can have is rice with a fried egg and fried plantains. They are great right out of the frying pan, but also with cheese on top. I like to use either queso fresco or feta cheese, the saltiness reminds me of an Ecuadorian cheese call queso de sopa (a soft crumbly salty cheese used in soups), or grated cheese that melts easily (quesillo, mozzarella, monterey jack or fontina). These plantains are also great as appetizers. If you love plantains or want to try different recipes, you can check out my collection of plantain recipes. Hi Jackie – Thank you! Sometimes the green plantains are not good quality and are bruised or already dried up so they don’t cook well, try to get green plantains that are firm and don’t have any brown spots on the skin. In my hometown we also make a soup with green plantains (or even green bananas – but they must be very green) and I was always told to not salt before and during the cooking process (only after), but that was more so that they wouldn’t turn brown. Also, depending on the plantains and the size they are cut, they could need more time. One option would be to boil the plantains separately, peeled and cut in half, then dice them and add them to the soup. Nunca he hecho platanos fritos, pero estan delicioso! Los hice para una asignación de mi clase española. Muchas gracias! Beautiful pics and directions! Tonight was my first time cooking plantains after years of just eating them. I love the cheese topping; it was a huge hit. Thanks and i’ll be coming back for more recipes! I really got into fried plantains after spending several months in Nigeria. Good stuff! 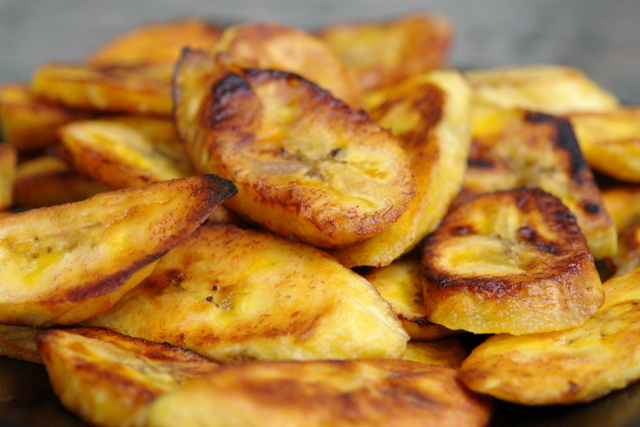 I have always loved fried plantain since my mother used to make it for us when I was young. She made it pretty much the same way as you said except she would sprinkle sugar on top of them after they’ve come out of the pan then we’d eat them with a bit of sour cream on top. It was so delicious! I’d love some more recipes too if you’ve got more! Thank you sooo much for your wonderful recipes! I teach cooking classes (and in a week ro so, one on Latin American foods!). The only way I knew to cook plantains was to fry them – either ripe or green – so thank you so much for all of your amazing recipes!! (I have also made fufu with plantains – though it is usually made with yucca, it was incredibel when I used the plantains!). I know that no one has commented since last year so I was really glad that this site was still available. I fell in love with fried plantains while in Mexico last week. A neighbor cooked them every day. The only difference between his receipe and yours is that he said he smashes them with the bottom of a glass to flatten them before cooking? Did I get that right? He also put salt on them which was so good. Thanks for this receipe…off to try them now. Finally! 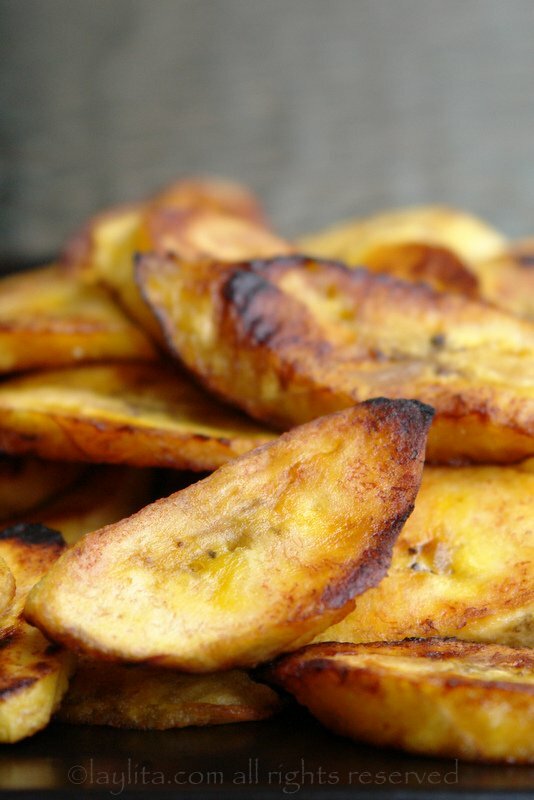 I have been searching for an awesome recipe to cook plantains – one of my husbands favorites. I am cooking this tonight, and I am saving your site to my “favorites”! do you use them green? These look wonderful! We make a dipping sauce of plain yogurt (we use soy but either are fine) mixed with our favorite spicy salsa and adds a nice kick and smoothness to these often underestimated treats! I’ve been a fan of plantains for many years, and have enjoyed these simple fried ones with black beans and rice for sometime. I would love to see more of your plantain recipes. Will you be posting more? 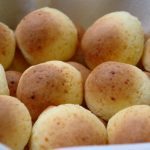 Hi – There are a lot of plantain recipes that I still need to post, in the next few weeks I should post a recipe for bolon de verde (green plantain dumplings stuffed with meat or cheese) as well as a ripe plantain puree that is a great side dish for meats. This is a typical latin american classic. 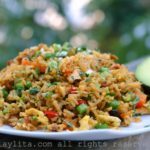 Thank you so much for this recipe Laylita. I usually eat platanos fritos in a typical Salvadorian breakfast, and sometimes my mother has made them for dessert. When my mother makes them for dessert, she sprinkles sugar on top and they are so sweet and delicious. For breakfast, we pair them with this Salvadorian “butter cream,” and its marvelous. 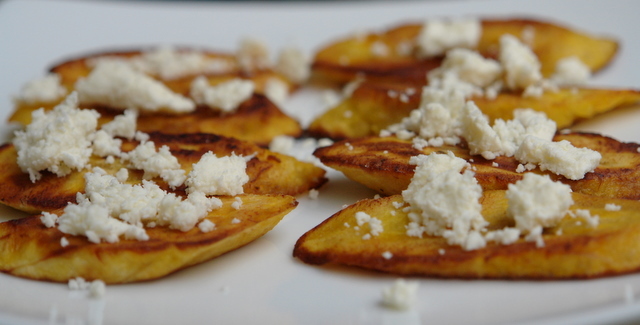 I highly recommend you trying these combinations for platanos fritos. Your recipe looks absolutely delicious! Paul – Thank you for the compliments. 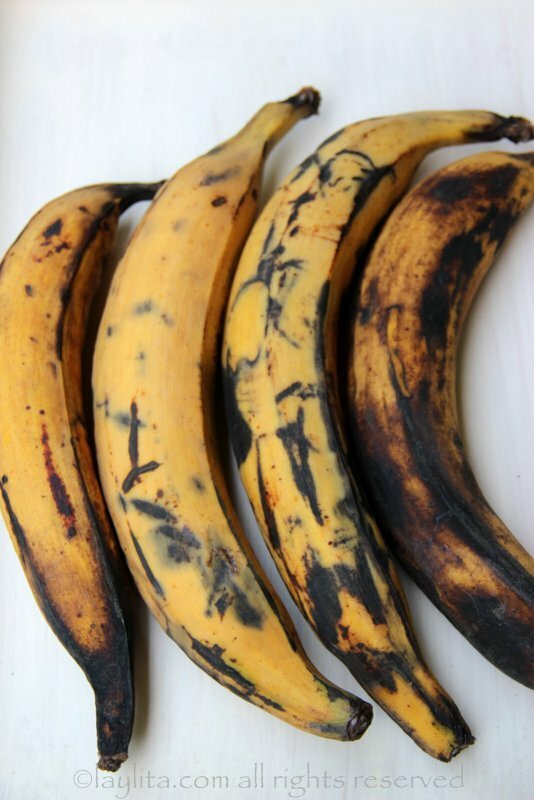 The easiest way to tell is based on skin color, any where from yellow to almost black is ripe enough, the riper the plantain the softer and sweeter it will be, some people like them very soft and sweet so they use very ripe plantains (almost black or completely black), I prefer when the skin is entirely yellow, maybe a few dark spots, but still a little bit firm, it makes it easier to cook them and it is just my personal preference. Thanks for a wonderfully written and photographed site, Laylita, it is an inspiration. 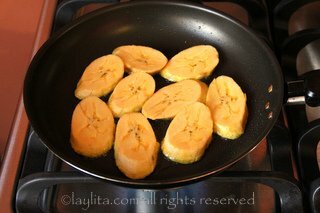 What is the best way to tell when the plantain is ripe enough to make platanos maduros? Is it based on skin or flesh color – or softness?